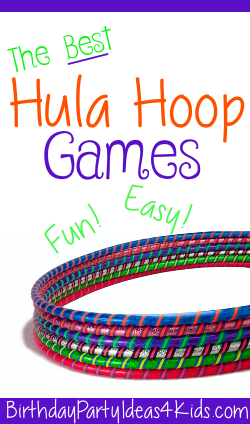 Fun and unique games that are played with hula hoops! Great games and activities for all ages, kids, tweens and teens. Perfect for parties, birthdays, backyard fun or anytime! Hula hoops are cheap ($1.00 at the dollar store!) and can be used in many games that will keep kids busy for hours. These are our favorite hula hoop games approved by the experts ... kids! All the games require 1 or more hula hoops to play. If any other items are needed to play the game they are listed in italics under the title of the game. Players try to throw 5 bean bags into targets - one in each target. Lay out the hoops on the ground in a straight line going away from the pitching line. Players stand on the pitching line and throw the bean bags to try and place one bean bag in each of the hoop targets. For older players and more of a challenge place the targets 1 to 3 feet apart. Set up hula hoops in a large circle - one hoop for each player. The more players the more fun! Players place their bean bags on the ground inside their hoop. On "go" all players have to run on the outside of the circle of hoops to another players hoop and grab 1 bean bag. They then run back to their hoop. When a player is inside their hoop a bean bag can not be taken from them. Players continue each round taking bean bags from other players until there is only one player with bean bags inside their hoop. On each round a player must leave their hoop and bring back a bean bag or they are out. Fast paced and lots of laughs! This is a fun tag game with a twist! Players try to avoid being tagged by running to the color of hula hoop that is called. Choose one player to be "it" and one player to be the "color caller". The Color Caller calls out a color of one of the hula hoops and all the players have to run and get inside a hoop of that color before they are tagged. Then another color is called and the players have to run to that color hula hoop. For large groups try to have at least 2 hoops of each color so that they can all fit inside. If tagged a player is frozen until all players have been tagged. Last player tagged becomes the new "it". Hang hula hoops from tree branches with twine in different levels and distances from the throwing line. Assign a point value to each target .. 2, 4, 6, 8, 10 points. Each player has 5 turns to throw the beach ball through the targets and then add up the points. Variation: Use Frisbees instead of beach balls. Set up hula hoops as an obstacle course and have players compete as teams or individually against a stopwatch. Set 5 or 6 on the ground one after the other - players have to hop through them. Hang from trees about 1 to 2 feet off the ground and players must crawl through them. Having 6 or 7 of these is lots of fun! Players must roll the hula hoop across an area - if it falls over they have to start again! Mark a starting line and a finish line at least 50 feet apart. Players roll their hula hoop hard enough so it will cross the finish line and while it is rolling they try to outrun it and beat it to the finish line. The hoop has to cross the finish line for the turn to count. Lay the hula hoops on the ground in a straight line - farther apart from each other for older children. Players line up and one at a time the first person from each team jumps inside each hula hoop, turns around and jumps back. Then the next person in line jumps through each of them and so on until the last team member has completed the cycle. Then add a few twists to the relay by having the teams jump backwards, sideways, crawling or crab walking! Individuals (or teams) compete to see who can roll their hula hoop the farthest from the starting line. One by one players roll the hoop across the play area and when it falls over and stops moving the distance is marked with a piece of tape or a flag. Divide players into teams and each team gets 1 hula hoop. Players line up one after the other and hold hands. Players cannot let go of each others hands during the game. The first person in line takes the hula hoop and passes it over their arm, over their head and legs and then over their other arm to the next player - without letting go of their teammates hands. The hula hoop has to go down the team line and then back again to the starting player. First team to finish and not let the hoop touch the ground wins! If the hula hoop touches the ground it has to be passed back to the front of the line and the team starts over. Variation: For a larger game area have the first player run to the end of the line after they move the hula hoop over themselves so that the line advances to a finish line. Have each player run to the end of the line after their turn until the whole line finishes. Just for fun and no teams: Have players stand in a circle and hold hands. Set up orange cones (or use other household items as targets such as milk jugs filled with sand or rocks, Frisbees, etc. ) as targets on the ground and give each one a point value ... 5, 10, 15 pts. etc. Set up a start line and have players try to throw hula hoops around the targets. Give each player 5 turns and add up points. Set out hoops an equal distance apart in a square pattern - one hoop at each corner with at least 20 feet between hoops. Divide players into 4 equal teams. Teams stand at their hoop and place their bean bags on the ground inside their hula hoop. Set a time limit - 5, 7, 10 minutes. On "go" all players run to another teams corner and try to grab a bean bag. They then bring it back and place it inside their teams hula hoop. Play continues until the time is up! The team with the most bean bags in their hoop at the end of the timer wins! Players can only carry one bean bag at a time. You will need 9 hula hoops set on the ground in rows of 3 x 3. This is the tic tac toe board. Teams line up at least 25 feet from the board. On go the first players from each team run to the tic tac toe board and place one of their team beanbags in a hoop. Then they run back and the next players in line run and place their beanbag in an attempt to get three bean bags either across, down or diagonal for a tic tac toe. Fast paced and lots of fun! Play lots of rounds. To begin players stand in a line and each hold a hula hoop. On "go" they throw the hula hoop in the air and try to catch it. Let players try several times to get comfortable with throwing and catching. Next have players stand in a circle about 5 feet from each other. Using one hh to start players toss the hoop around the circle to the player to their right. After a few rounds add another hoop to the circle and have them both going at the same time. A few more rounds and add another and another until everyone has a hoop that they are catching and throwing at the same time. With more and more hula hoops in the game have everyone step back one step so there is more space in between players. Play elimination (if a player drops it they are out of the circle) or non elimination and work as a team to keep the hoops off the ground. We have more fun party games for kids of all ages!